Looking for a vintage watch? Take a look at our Bahamas collection that features watches with the perfect mix of old school and new school. Square face, dual dials and a chunky wristband were added to make sure it doesn’t go unnoticed. Pair it with jeans or even shorts for a day at work or a day at the beach. 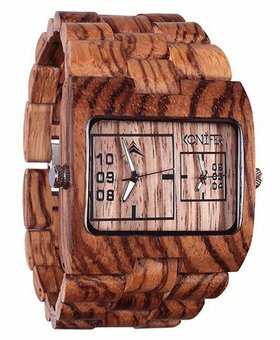 Handcrafted in central African wood, and finished with a satin oil finish, these Bahamas watches won’t disappoint you!